Upgrading or Installing Lighting in Athens, Georgia? Known as the contractor to call for lighting in Athens, GA, Meehan Electrical Services has been servicing the local area since 1960. Our installers have worked in countless homes and businesses across the region, providing lighting design and installation both indoors and out. Our experienced electricians are trained in local building codes. Working in Athens for years, Meehan Electrical Services technicians have completed outdoor lighting projects, as well as indoor lighting design and installation. Our staff must maintain up to date skills and Meehan Electrical Services provides fully licensed services for lighting projects of any size. Meehan Electrical Services deals with the leading lighting manufacturers, offering Athens customers the best and latest technology, fixtures and controls. Combine quality materials with expert installation and your Athens lighting project will be well taken care of by Meehan Electrical Services’s professional staff. From modern ceiling fans and light fixtures to the latest track lighting and recessed lights, Meehan Electrical Services offers high quality materials in both classic and modern styles. 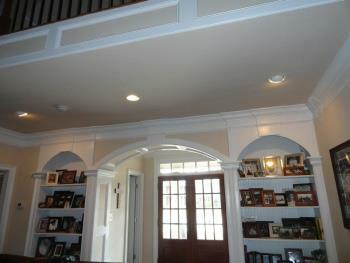 Lighting design and installation projects move forward efficiently with Meehan Electrical Services at the helm. Athens residents can rely on prompt service from the estimate stage, straight through to the installation and final inspection. Meehan Electrical Services electricians aim to create trust with every Athens customer, keeping their word and doing a careful job every time. Customers that are planning to install lighting in your Athens, GA home, office, or facility, you can trust the experience and reliability of Meehan Electrical Services. For high quality materials and professional technicians, call Meehan Electrical Services at (706) 717-4947 to arrange for your free quote.